Children learn through play, therefore the focus of the 3-Day Class is to provide the appropriate play in which children can develop their social, cognitive, and emotional selves, along with further mastering their fine and gross motor skills. Building a child’s self esteem is also central to the SJPPNS philosophy. Self esteem and the ability to learn are interdependent. The 3-Day curriculum supports that philosophy. In order to support the developmental growth of children, the 3-Day Class offers activities in the areas of Science/Sensory, Math, Art, Blocks, Literacy, Storytelling, Kitchen, Dramatic and Outdoor Play. 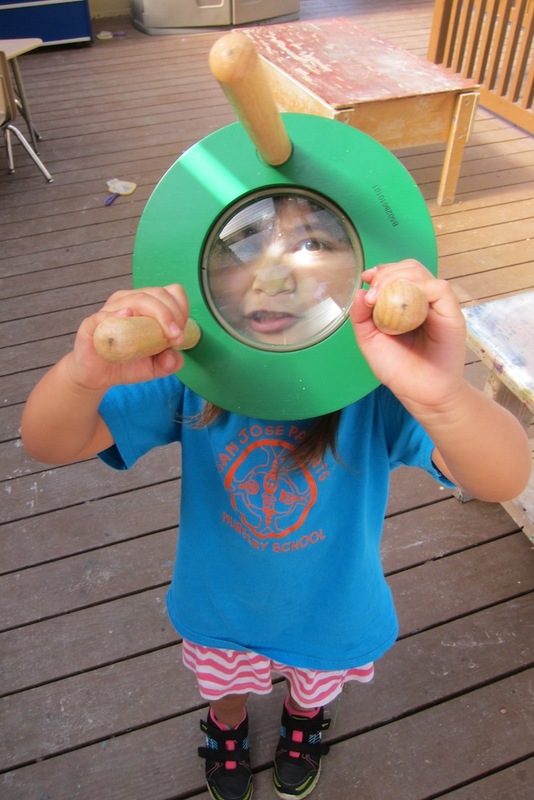 We encourage exploration and experimentation in all these areas in order to build an early love of learning, the foundation for future learning. The class also provides a variety of field trips and classroom presentations to support some of the activities offered in the classroom. The circle times at SJPPNS are designed to teach, share and provide music and movement activities. It is an opportunity for the teacher to begin to work on sitting, listening, raising hands, and group interaction skills. It is also a time to learn how to respect others when it is their time to share. Social development is a very important part of the 3-Day Class. At this age the children begin to form friendships, and by the end of the class, there are some solid relationships formed amongst the children. This is the age where playing with other children supersedes playing with adults. Children work cooperatively in groups, or one-on-one, to engage in imaginary play and to achieve a goal. In our 3 day class, with a standard class size of 24 children, we generally have approximately 8 working parents each day. Parents are expected to work one day per week, with an additional few days per year of "on-call" days. Once assigned a workday in the beginning of the year, parents will work on the same day each week, with the ability to swap with other families to cover sick days, vacation, etc. 9:10AM Morning Time. This is when we welcome the day with a hello song, a story, and a chance for the children to share with their classmates the activity that their parent will be in charge of for the day. 10:50AM Circle Time #1 Children will be broken into two groups, and while one group goes inside to experience circle time, the other group will enjoy free-play outside. Parents will be assigned either as outside monitors, or to help with circle time, according to their work-cards. 11:30AM Goodbye Time. Working parents complete their work-card tasks, and everyone says farewell until the next class! 11:35AM Conference Time. This is a time for the working parents to meet with the teacher for 10 minutes to discuss the successes and challenges of the day.